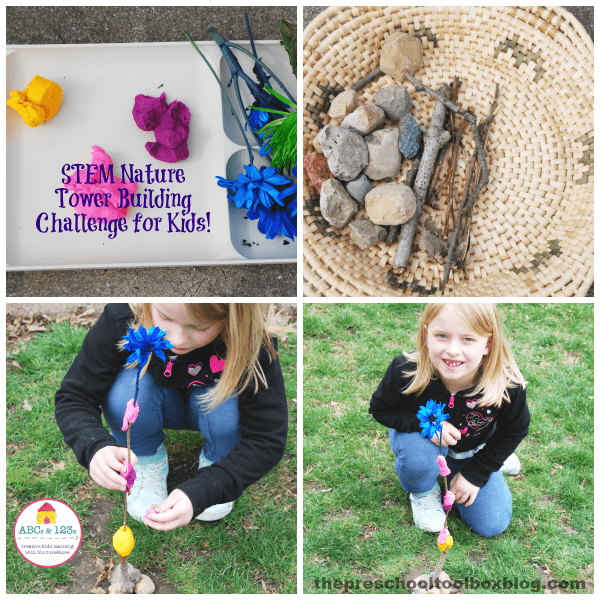 Today we’re engineering with nature as Darla from The Preschool Toolbox joins our ABCs and 123s series with a tower building challenge. If you are new to NurtureStore’s 123 and ABC’s series, we welcome you to fun activities to promote playful learning! STEM (Science, Technology, Engineering, and Math) activities compel kids to use cross-disciplinary tools and critical thinking skills to solve a basic problem. By integrating STEM activities into normal daily routines, kids can gain new knowledge while they play to develop problem-solving skills that can be applied to the everyday world. Come explore the fun of an outdoor STEM challenge for kids using only 10 items from nature and playdough. 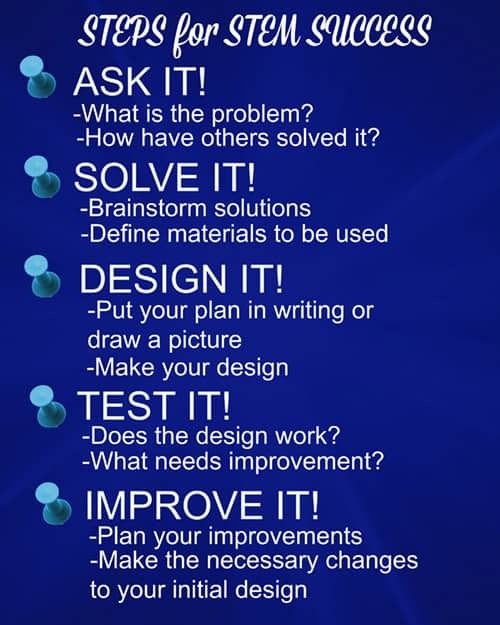 If your kids have not played with STEM challenges, introduce them to the ‘Steps to STEM Success’ below. Challenge Inquiry (problem to solve): Kids (individual or small groups) are challenged to use critical thinking and cross-disciplinary skills to construct the tallest free-standing tower they can using only 10 items they can find in nature and playdough. Science: Kids will explore the design and construction of a tower through individual (or collaborative) use of skills in the scientific method: observing, communicating, comparing, organizing, and relating. Technology: Kids will use digital cameras to photograph the free standing towers for documentation of learning and will watch a video about the largest towers in their world. Engineering: Kids will construct a free-standing tower that exhibits early attempts at engineering. Math: Kids will explore geometric shapes, numbers, lines, weight, and patterns as they design and construct the free-standing towers. The world’s engineers have designed spectacular structures. The Burj Khalifa in Dubai holds the current title as the world’s tallest building at over 800 meters tall. The Shanghai Tower in China ranks at number two and is 632 meters tall. The Mekka Royal Clock Tower, Saudi Arabia, claims its place as the third tallest at 601 meters tall. In the United States, One World Trade Center (New York City) ranks fourth and stands at 541 meters. In 2019, the Kingdom Tower (under construction in Saudi Arabia), will claim the number one spot upon completion. This magnificent building will stand 1008 meters tall and surpass the Burj Khalifa. Prior to the Tower Construction Challenge: invite the kids to scavenger hunt for 10 items they think will work to construct the tallest free-standing tower. 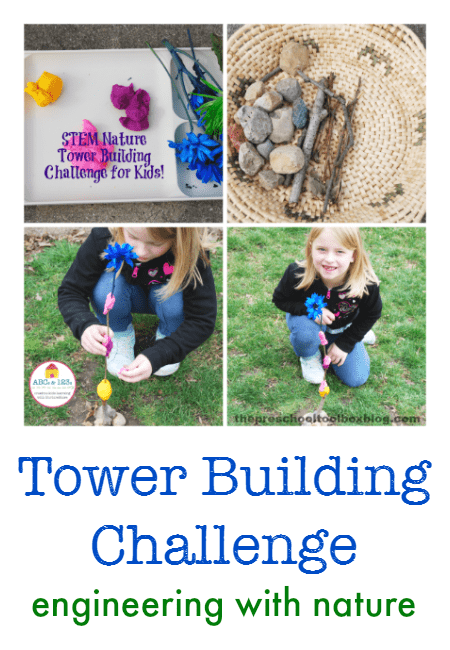 If doing the challenge in a classroom environment, ask students to bring in items from nature to be used in the tower constructions. Ask the kids to make a mental or written plan (drawing) for the tower constructions using just the 10 nature items and playdough. No additional supplies will be given. Time given to hunt for items, design (plan), and construct the tower is 25 minutes (have a digital timer or clock available). The towers must be free standing (without aid from the kids). At the end of the allotted time, all towers will be measured from the lowest point to the tip of the tower to determine which tower is the tallest. The kids will ask how to construct a free-standing tower. Try to follow-up with open-ended questions that will allow the kids to think and solve the problem using their own critical thinking skills. In the photograph above, two children created similar towers. In the first photo, the child used rocks to support her stick tower base as the mud she chose was loose and her tower collapsed. In the second photo, the child chose a larger stick for the base and the mud held it upright without the addition of support rocks for the base design. When finished with constructions, have the kids use a ruler to measure their tower from the base to the tip of the highest point. Invite the kids to use a digital camera to photograph the construction phase of the towers and final heights. Kids can then use the photos for a printed book, to make an online slideshow, or to display at home or in the classroom. Watch the following video about the construction of the Kingdom Tower. Invite the kids to discussion with the following questions: What base design did the winning tower have? What base did your own tower have? What would you do differently with your tower design next time? What were the challenges in construction (as an individual or as a team)? Do you think that engineers who design tall buildings must overcome challenges, too? What challenges might there be in creating a very tall building? As kids employ STEM skills and begin to use critical thinking, they will garner the tools necessary to apply that knowledge to challenges and problems they encounter in the everyday world. 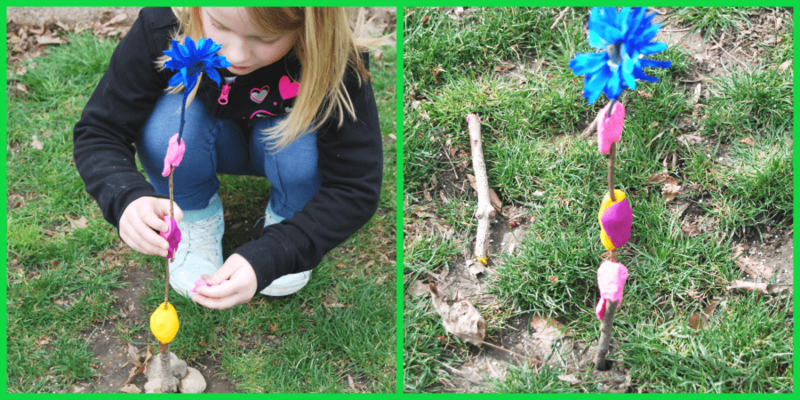 Playful and FRUGAL Learning Activities with STICKS! Playing to LEARN with ROCKS in Preschool! 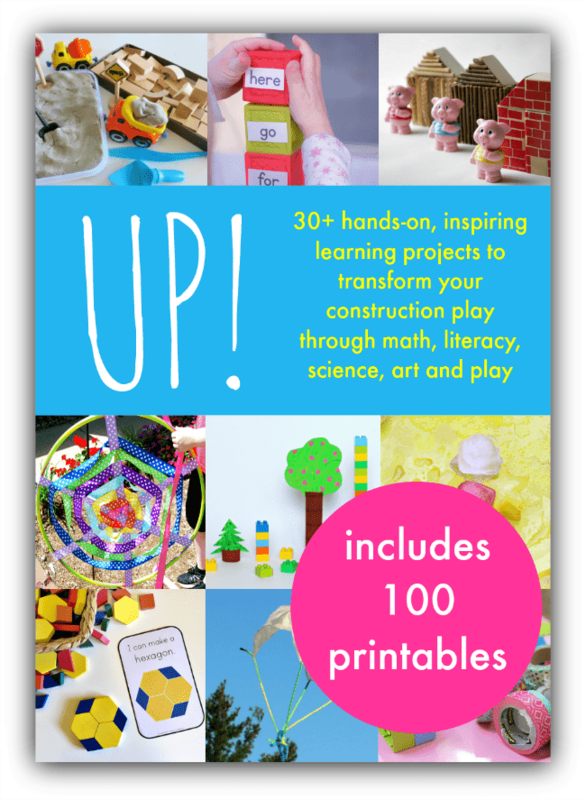 About the Author: Darla Hutson is an educator, wife, mom of 6, grandmother to 5 girls, and owner/editor of The Preschool Toolbox Blog: curriculum and playful learning activities for Preschool and Kindergarten. Please join our closed FB group for discussions about playful learning in Early Childhood.